CHICAGO – There was no film in 2012 that moved me more deeply or left me feeling more exhilarated than Stephen Cone’s achingly personal masterpiece, “The Wise Kids.” It’s the sort of film that I’ve been hoping to see get made for quite some time. Whereas so many films about people of faith rely on condescending stereotypes to push a contrived agenda, Cone’s picture is humanistic in every sense of the word. From the titular trio down to the smallest speaking role, every single character in “The Wise Kids” is thrillingly alive. It’s clear that Cone has a deep understanding of the Southern Baptist community portrayed in his film. There are no easy answers for the questions this movie provokes, nor are there any heavy-handed speeches designed to spoon-feed glib morals. Cone wants to start a dialogue on vital issues rather than pretend to be the final word. He has the same respect for his audience that he has for his characters. “The Wise Kids” isn’t just about three teens grappling with their identities in the pivotal summer months between high school and college. It’s about the generations before them that wrestled with those same inner conflicts, and it’s entirely a testament to Cone’s brilliantly textured and subtle script that none of these parallels are painted in broad strokes. There are various intriguing connections that can be made between each teen and the adults that they encounter in their church congregation. As newfound tolerance starts to undo the societal repression of past decades, the kids in Cone’s film are able to come to terms with their true nature with more clarity and wisdom than their elder counterparts. Whereas young Tim (Tyler Ross) has already made the first major steps toward acknowledging his homosexuality in the presence of his family and close friends, the church’s music director, Austin (deftly played by Cone), is struggling to remain closeted. When his wife, Elizabeth (Sadieh Rifai), asks him to play a romantic tune on the piano in a heartrending attempt to recapture the warmth she once felt with him, Austin breaks the mood by admitting, “I’m not feeling it.” The pastor’s daughter, Brea (Molly Kunz), echoes Austin’s sentiments when she suddenly finds herself unable to sing the lyrics of a standard church hymn. The first pangs of doubt have begun to rupture Brea’s once indomitable faith, thus causing her to ask Elizabeth for advice. “Don’t think so much” is Elizabeth’s recommendation, as well as the mantra that has surely allowed her to turn a blind eye to her husband’s orientation while privately pining for intimacy. 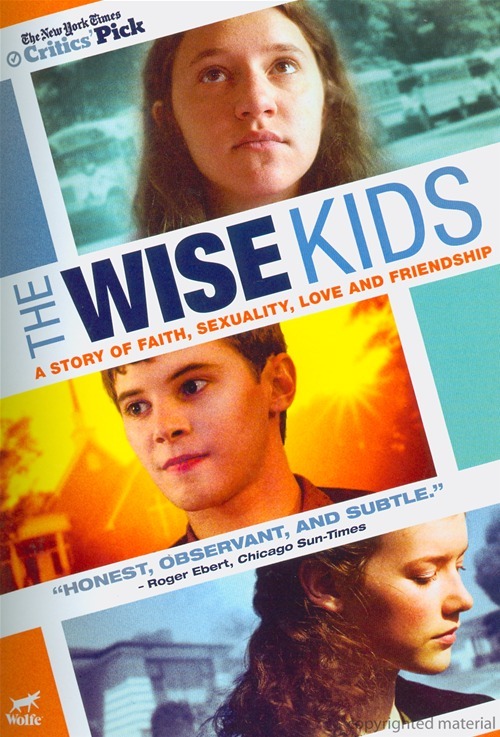 The Wise Kids was released on DVD on January 8th, 2013. Stuck in the middle of all this soul-searching is Laura (Allison Torem), a religiously devout teen who can’t understand why her once-close friends have begun to drift further and further away from her judgmental gaze. She’s perhaps the character most impacted by Tim’s homosexuality, which hasn’t damaged his own spiritual life one iota. Ascribing to a black-and-white interpretation of the Bible, Laura is the sort of person routinely transformed into a bubble-headed bigot in Hollywood offerings (Mandy Moore’s admittedly amusing narcissist in “Saved!” comes to mind). Yet Cone’s compassion doesn’t cease when exploring this character, and the casting of Torem, an acclaimed veteran of the Chicago stage making her feature film debut, proves to be a masterstroke. Torem infuses Laura with such beguiling conviction and startling vulnerability that she emerges as a strong, enormously complex character in her own right. When she defends her unwavering beliefs in the face of a new roommate or pleads for Brea to not leave her faith lightly, Laura’s insecurity is illuminated even as she stands her ground. She’s no less bewildered than her peers—perhaps even moreso—and every bit as sympathetic. Just because the characters in “The Wise Kids” end up marching to the beat of their respective drummers doesn’t mean they can’t bask in the communal warmth of a church gathering or feel united by their shared humanity. With its uniformly excellent performances, sublime cinematography by Stephanie Dufford and richly evocative score by Mikhail Fiksel, Cone’s film stands as an indelible example of independent filmmaking at its most assured, honest and indispensable. Forget “Argo,” “Les Misérables” and all the other overhyped Oscar bait. This is the best film of 2012. “The Wise Kids” is presented in its 1.85:1 aspect ratio and includes two superb featurettes by Shane Simmons and Marty Schousboe, melding behind-the-scenes footage with enlightening interviews. Cone is careful not to overstate his intentions, enabling the audience to draw their own conclusions while still providing enough insight to facilitate rewarding post-film discussion. He’s that rare breed of filmmaker with the potential to alter minds, open hearts and bring about real change. I can’t wait to see what he does next. ‘The Wise Kids’ is released by Wolfe Video and stars Molly Kunz, Tyler Ross, Allison Torem, Stephen Cone, Sadieh Rifai, Sadie Rogers, Cliff Chamberlain, Matt DeCaro and Ann Whitney. It was written and directed by Stephen Cone. It was released on January 8th, 2013. It is not rated.